Quaife Limited Slip Differentials power both drive wheels under nearly all conditions, instead of just one. With an ordinary open differential, standard on most cars, a lot of precious power is wasted during wheelspin under acceleration. This happens because the open differential shifts power to the wheel with less grip (along the path of least resistance). The Quaife, however, does just the opposite. It senses which wheel has the better grip, and biases the power to that wheel. It does this smoothly and constantly, and without ever completely removing power from the other wheel. In drag-race style, straight-line acceleration runs, this results in a close to ideal 50/50 power split to both drive wheels, resulting in essentially twice the grip of an ordinary differential (they don’t call open diffs “peglegs” for nothing). In cornering, while accelerating out of a turn, the Quaife biases power to the outside wheel, reducing inside-wheel spin. This allows the driver to begin accelerating earlier, exiting the corner at a higher speed. The Quaife also controls loss of traction when the front wheels are on slippery surfaces such as ice and snow or mud, providing the appropriate biased traction needed to overcome these adverse conditions. Quaife Limited Slip Differentials provide constant and infinitely variable drive. The Quaife’s unique design offers maximum traction, improves handling and steering, and puts the power where it is needed most. A definite advantage whether on the track or on the street. 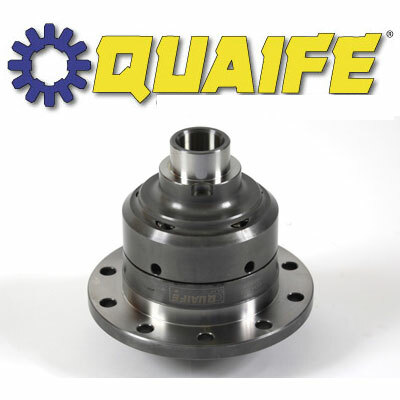 The Quaife is extremely strong and durable and since the Quaife is gear operated, it has no plates or clutches that can wear out and need costly replacement. The Quaife is great for street driving or racing. Racers don’t have to put up with locking mechanisms or spools that created unwanted understeer under power, or in the case of front-drive cars, even tear the steering wheel out of their hands when cornering. Because it behaves like an open differential during ordinary driving, street drivers will have trouble telling it’s there until pushing the car’s limits. The Quaife has been proven in everything from SCCA Rally to Formula 1. It provides autocrossers with such an advantage, it has become “required” equipment for a winning effort. More and more auto manufacturers are specifying the Quaife ATB Differential as original equipment in their high performance models – for good reason – it works! 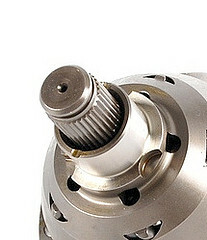 The Quaife ATB Differential comes with something else other’s don’t have: a Limited Lifetime Warranty. This warranty applies even when raced !